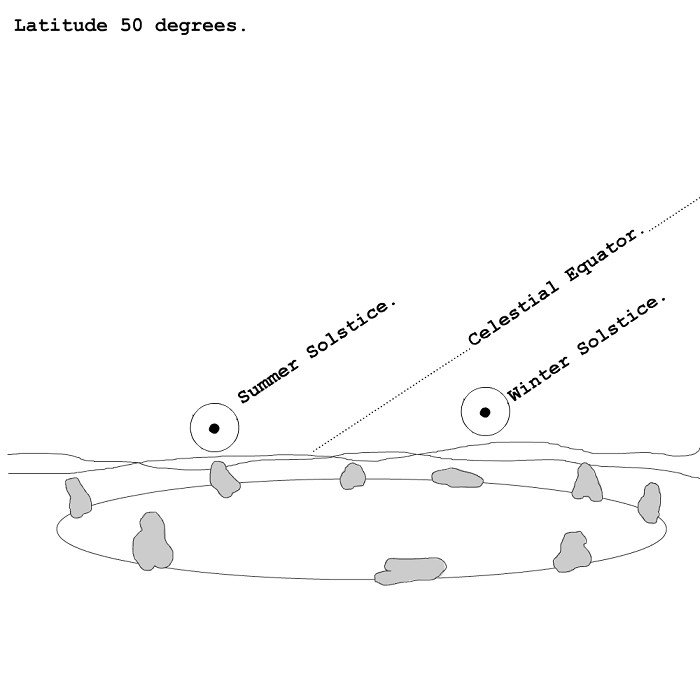 The solstice sun position as an ecliptic marker. The sun is so obvious, so bright. It drowns out the stars and gives the impression that a rotation of the earth should be measured in relation to the sun. Each time the earth makes a single rotation the axial tilt causes the angle between the celestial equator and the ecliptic to sweep down to -23.4 degrees and back up to + 23.4 degrees, then back down to -23.4 degrees. One rotation of the earth takes 23 hours and 56 minutes, and one rotation of the earth in relation to the sun takes 24 hours. That difference of four minutes causes the same, daily change in declination to be repeated over the duration of one year. It effects the position of the sun, moon and stars as seen from the ground. The most obvious effect is the change in solar declination and in the constellation of the zodiac 'behind' the sun. The four minutes difference between solar and star time means that the sun appears to move through all the constellations of the zodiac (along the ecliptic) from Aquarius to Capricorn in the course of one year. And the sun to travel the sky at a minimum of -23.4 degrees below the celestial equator at the winter equinox, and at 23.4 degrees above the celestial equator at the summer solstice. The celestial equator is 90 degrees to the celestial north pole. The solstice occurs when the sun is at a maximum northerly position and six months latter when the sun is at a maximum southerly position. 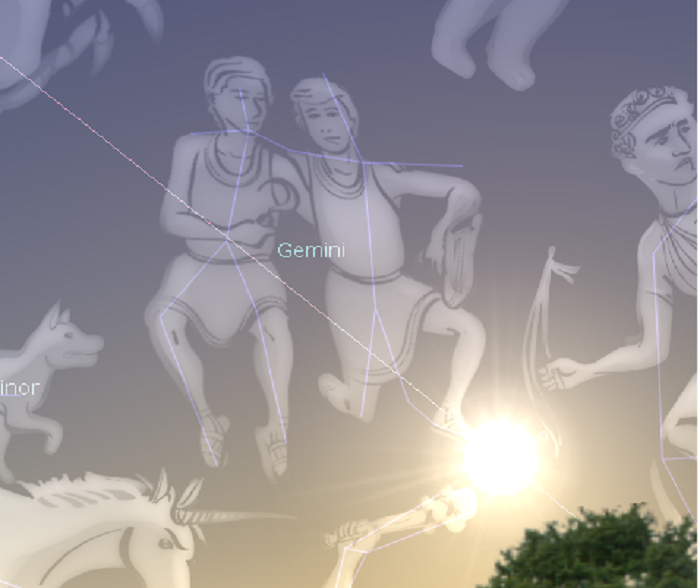 As the sun crosses the meridian in June it rises and sets with the zodiacal constellation of Gemini behind it. This is true in the northern and southern hemispheres of this planet. The length of a day is measured by the sun and not by the stars or moon. This measurement has to be in relation to a fixed point - or in relation to a 'fixed' phenomenon. 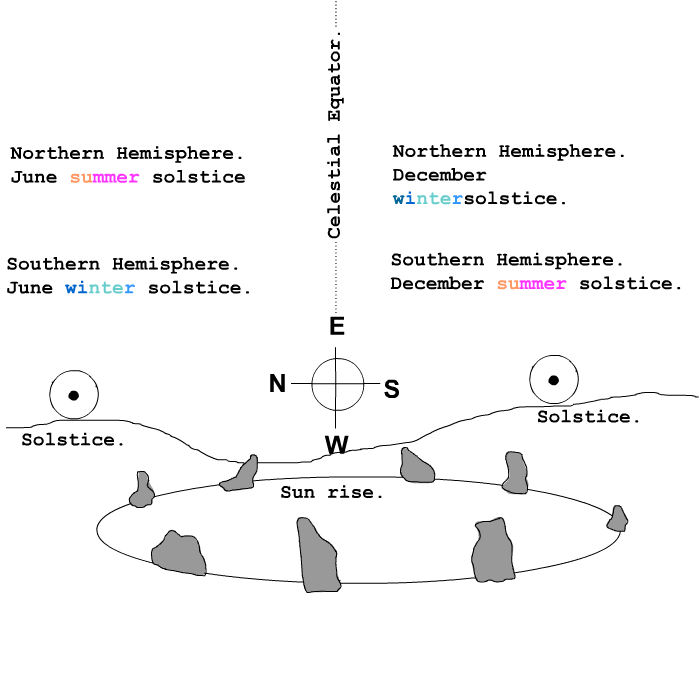 The length of a day changes in a regular pattern, from shortest in winter to longest in summer. 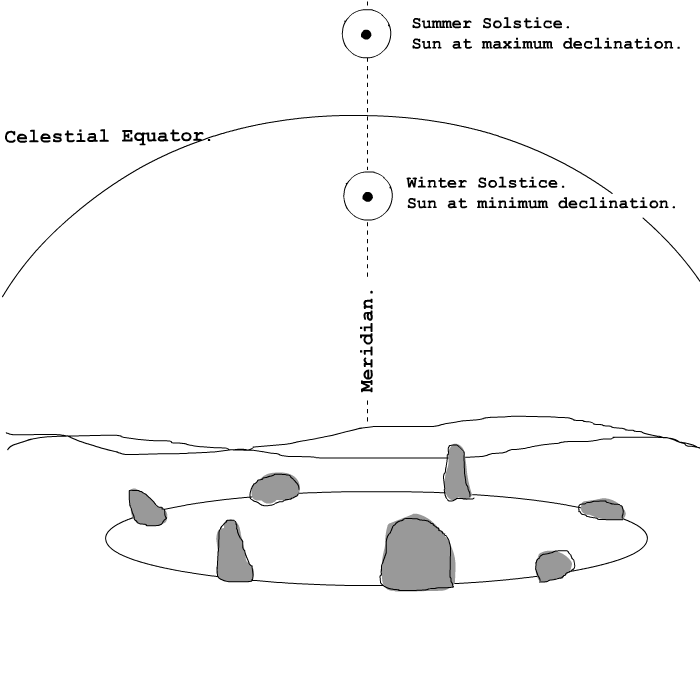 The position of sunrise and set change with day length. The only constant is that the sun can be seen to cross the meridian once every day - crossing the south meridian for observers in the northern hemisphere, crossing the northern meridian for those in the south. A shadow cast by a stone or a post is shortest at midday. 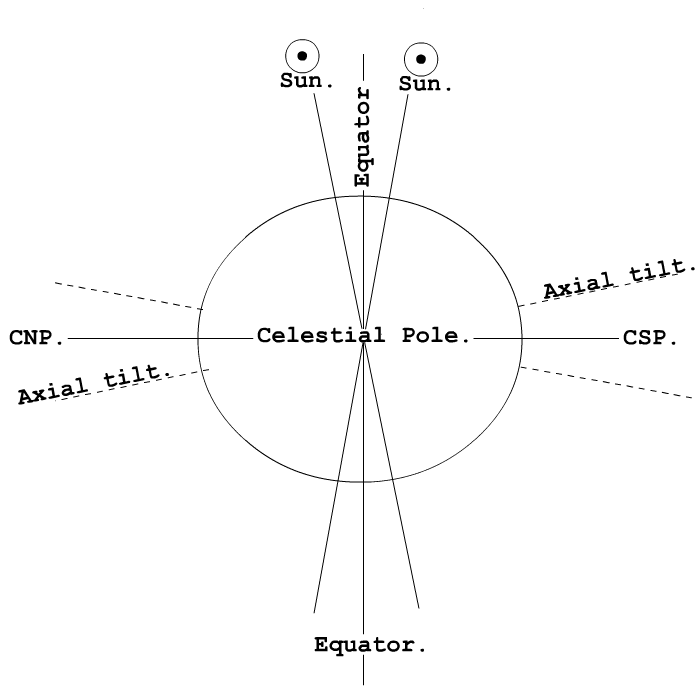 This time period between shortest shadow to shortest shadow varies slightly depending upon our distance from the sun, if we are furthest away from the sun - aphelion - or closest to the sun - perihelion. Nevertheless, measuring the midday shadow length over the course of a year provides useful information about the declination of the sun. As a general rule, you will have at least seven days either side of the actual solstice date, in which the sun will rise at more or less the same azimuth. This phenomenon is the origin of the term, solstice. It is as if the progression of the year is suspended, until the sun rise positions begin to move on again.